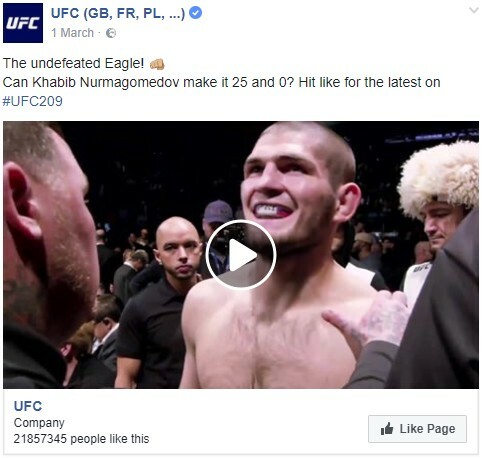 We worked with Ultimate Fighting Championship to acquire new fans for their Facebook page, while promoting the UFC 209 fight. Fan acquisition was driven through targeted advertising. Video footage was used with the hashtag #UFC209 to build up excitement about the event on Facebook. Audiences were targeted through demographic and interest profiling. Users had the opportunity to Like the page, engage with the posts, and consume more content released during fight week. Facebook users in Italy, Poland, and the UK were shown different ad creative versions, with text in Italian, Polish, and English respectively. Different thumbnails and call-to-action text were tested in rapid bursts with high volumes of data, to determine top performers, and optimise ad serving. New followers won for under 10p per Like.